Can’t believe I missed Snapshot Saturday last week but somehow I did! I love being part of this link up and I don’t like to miss out. Snapshot Saturday is hostessed by Melinda at West Metro Mommy. Be sure to check out all of the other great photography there when you’re finished here. You’ve heard me talking about my trip to Maine. 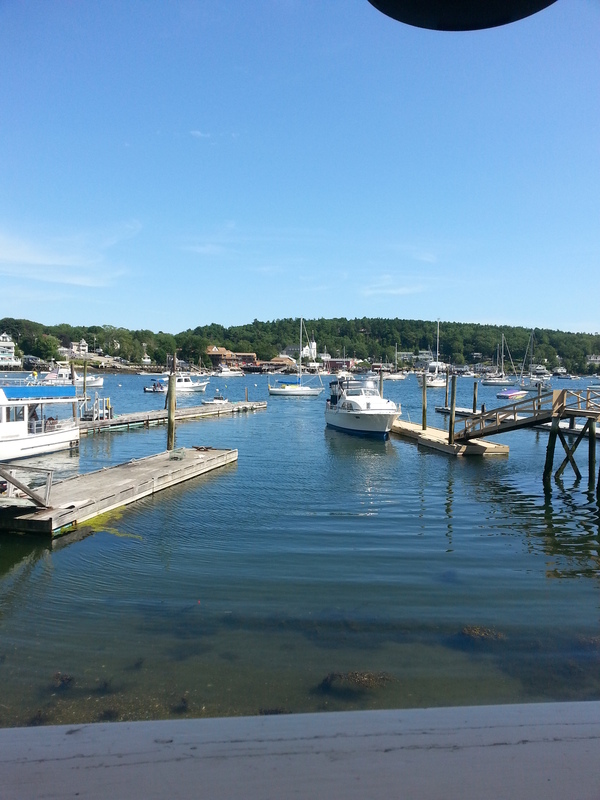 Maine has been a favorite place for me since my friends Gail and Alice and I went there more than 20 years ago. It is one of the most beautiful places and we kept going back year after year. It was so exciting when two years ago Gail was able to get her own cabin there. I spent two wonderful weeks there at the beginning of August. One of our favorite places for lunch was the Blue Moon Cafe. This photo is a shot I took with the phone on my camera from the deck behind the Cafe. I was quite impressed that my phone could take such a great photo. It’s such a beautiful harbor. I loved the photo so much that I’ve made it the background on my phone. I was also impressed that I figured out how to transfer this to my computer so that I could use it here. I’m getting better at this! Don’t forget to check out the other Snapshot Saturday linkers at West Metro Mommy. Happy Snapshot Saturday!! Enjoy your holiday!! That is a fabulous shot, Fran, and I envy you the trip to Maine. I have been reading so many books set in Maine…and I’m seriously wanting to go! Thanks for sharing…and for visiting my blog. Laurel, if you’ve never been to Maine you should go. I know it’s a long way for you but truly worth it. Thanks for stopping and have a great weekend! What a view! Bet the breeze was heavenly! Hi Susan! Yes it was and we went back several times for lunch. Such a wonderful spot. Have a great weekend! Wow…Gorgeous. So many beautiful places in the USA. There really are beautiful places to visit, Elizabeth. I was so lucky to have a chance to spend time in Maine. Have a great weekend! I’ve never been to Montreal but I hear it is beautiful! Enjoy your stay there!! Maine is on my list of go-to vacation spots! So much of the US that i haven’t seen. Thanks for the photos. You must see Maine! It has been one of my favorites for Years!! Don’t wait…go now!! Thanks for visiting and enjoy your weekend! The quality of phone cameras always surprises me too. Beautiful picture! Thanks, I was just amazed when I saw the quality of the photos. Now that I’ve learned how to get them to the computer, I’ll probably use it more often! Have a great weekend! What a lovely place to eat. It was just beautiful, Ginny! Can’t wait to visit again. Have a great weekend! I love the blue of the water and all the boats, and it’s such a clear shot!! Vicki, I was so pleased with how this turned out. The camera in this phone is amazing and now that I’ve figured out the secret (no secret really 😉 ) I’ll be using it more often. Have a great weekend! You know I am obsessed with Maine…gorgeous pics Fran! I hope you have a great Labor Day! Thanks, Ameena! When I figure out how to resize photos from my DSLR I’ll be posting more. Didn’t realize the phone in my camera could work so well!! Are you still on the other side of the pond! Nice view! Maine is one of my favorite spots too. We go often. Your friend is so lucky to own a cabin there! Hi, Peggy! Thanks for visiting. Maine is wonderful and she know’s how lucky she is…she’s wanted this for years! Please stop by again! Pretty picture Fran. There’s something so calming about water for me. I could look at that harbor all day, Meghan and we did that some days. What an incredible place. Glad you like my photo!